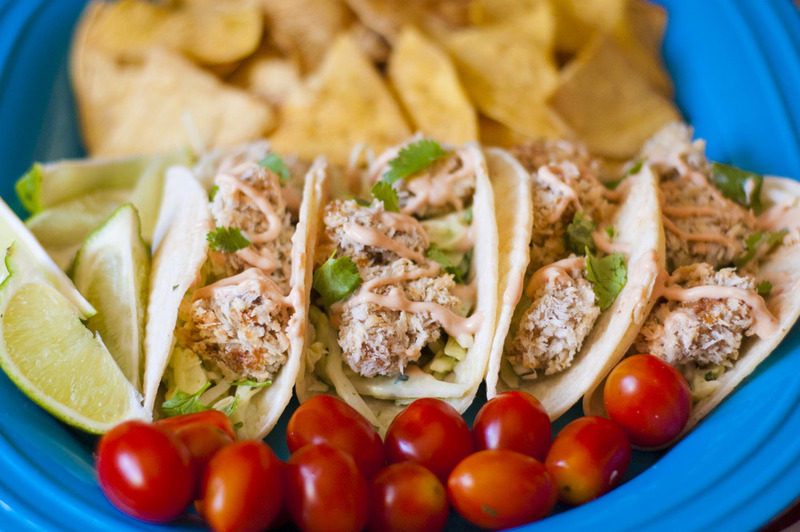 Crispy Tofu Fishy Tacos: Virtual Vegan Potluck! Welcome everyone taking the tour of the Virtual Vegan Potluck! I'm so excited to meet new people and I welcome you to comment, send me a message, or talk to me on the Facebook page. 'm super friendly and love meeting new plant based people! In honor of the Virtual Vegan Potluck I decided that today I would share something extra special - A recipe from the first ever Fo Reals Life Booklet: "Vegan Taco Party!" I am so super proud of this. So now - what's a booklet? It's like a book but smaller. This thing is 100% made by me, as well. 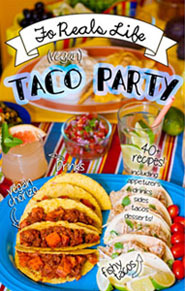 It has over 40 recipes including drinks, appetizers, tacos (of course! ), sides and desserts! There are also color photos of every recipe and it's A COLORING BOOK! Making it the coolest little vegan book I've ever dreamt of making. Check out the coloring page below - you can print it out now and color it in while your crispy fishy tofu bites are baking! Click here for more details and to pre-order your copy! You get a sweet deal that way. Booklets will start shipping out May 17! OKAY OKAY - Time for TACOS, baby! It is getting to be warm outside and I'm dreaming of sitting on a beach watching the waves. And eating fishy tacos. Vegan fishy tacos. Made out of tofu.. yeah... with some creamy chipotle sauce. Maybe add in a beer with a lime and I'm golden. While I may not have the beach that I'm dreaming of (yet!) I've figured out how to make some crazy crispy tofu fishy tacos that kind of blew my mind. They are marinated in beer (yeahhhhh!!) and kelp powder. That stuff is crazy! It makes them taste just like.. well... fishy! Which was mind blowing for me. Okay so I've been vegan for quite some time and haven't had fish in forever but I've got a pretty amazing memory for food if I do say so myself. h and here is the coloring page that I drew for this recipe that is the in Taco Party Booklet - Yeah, its a cat fishing into the taco and another one going "Mission Impossible Style" into it! Just click the picture to enlarge it and then you can save it to your computer! Then you can print it and color it while you're cooking away. r let your kids color it if you're feeling nice! Tear the tofu into bite sized pieces (small 3/4" - 1.5") and put into a zip top bag. Add in the lime juice, beer, kelp powder and salt. Squish it all around to really mix everything together. Marinate it in the refrigerator for 1-4 hours. When the tofu is done marinating preheat your oven to 400 degrees. Line a baking sheet with parchment paper and set it aside. Now to make the dipping station! First, mix all of the ingredients for the flour mix together and put that on one plate. Pour the soy or almond milk into a bowl and set that next to the plate. For the last dipping station pour the panko bread crumbs onto a place and put that on the other side of the soy milk. So it goes : tofu, flour, milk, panko, baking sheet! 1.) Take the tofu (a few pieces at a time) and roll them around in the flour mixture making sure to completely coat them. 2.) Dip the flour dredged tofu into the milk very quickly to wet the mixture. 3.) Roll them around in the panko until completely coated. 4.) Place onto the parchment lined baking sheet making sure to leave a bit of room between each piece. 5.) Repeat until you've coated all of your little tofu bites. Place into your preheated oven and bake for 25 - 30 minutes, or until lightly browned. ake the chipotle sauce: just blend everything together! Add extra sugar, salt or chipotles (if you dare!) to taste! *To taste means that you actually TASTE IT and think "hmm this is good but I want it saltier!" or "hmm more sugar!" or "Ohhh this tastes awesome just the way it is!" - always taste! Now - just throw some shredded cabbage down on some warmed corn tortillas, top with your fishy tofu bites, some sauce, maybe some cilantro, (some avocado!) and a hefty squirt of lime juice. I suggest eating these on the porch with a good beer and maybe some watermelon as dessert but that's just me craving summer. ow to navigate you on in the potluck! Click the links below to go forward, backwards or back to the beginning! Go back to the beginning of the potluck here! Oh and if you want to keep up with the recipes here you can follow what I'm up to on the Fo Reals Life Facebook page or on Twitter!